What kind of wedding gift do you get the groom who has everything? How about a song celebrating his engagement? 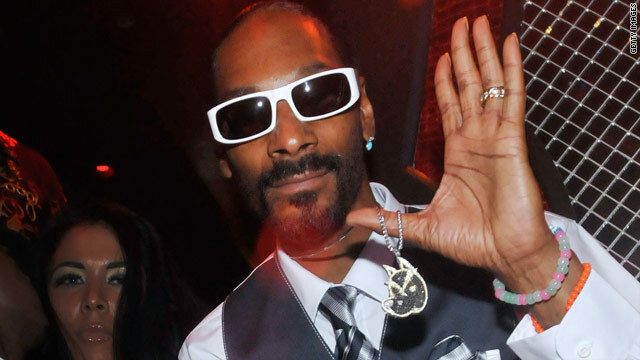 In honor of Prince William's April 29, 2011, nuptials to Kate Middleton, Snoop Dogg has released "Wet," a song he thinks is perfect for the blueblood's bachelor party. “When I heard the royal family wanted to have me perform in celebration of Prince William’s marriage, I knew I had to give them a little something,” explains 39-year-old Snoop in a statement. The rapper is reportedly among the entertainers being recruited by Prince Harry for his big brother's engagement blowout. The fan who gets the most views will win a trip to the U.K. to celebrate the song's release in royal fashion, according to a statement from EMI Music. Queen Elizabeth would surely agree. This are some of the bestdirections I've ever? read. This is the brilliant article for not olny anyone who is new on this topic. lol....... I read about this on http://www.dreamroyalwedding.com I wonder if he would be the right type of image for a Royal wedding ? What are you people talking about? Why would the Queen be at the batchelor party? With Snoop, I know a lot of things will be, "smokin". Work it Dog. WOW. Can you imagine Her Majesty walking into the bachelor party and hearing "Wet" booming on the old royal sound system, then a chronic'd up Snoop leaping down from the stage and trying to get Queenie to get her groove on? Fo shizzle! So I guess he was supposed to have asked no talent Taylor Swift to come? Everybody knows that as far as music goes, HIP-HOP RULES THE WORLD. By the way white people, Kanye has the #1 Album and I checked on Google and it said Prince William wants Kanye to come and perform 'Power'. Sorry HATERS this just isnt your week! LOL! I don't listen to Snoop's music or rap music for that matter, but I'm happy that he was invited. Time to change the royal's tradition and get with the modern times. Good for you Snoop!! I hate rap but snoop's style is the only one that hooks me. Go get em dog! Is this the best we can send over there? Come on people. Ha the official song of the Royal Family is about getting girls wet! England is so awesome, can you imagine Obama agreeing to have this as his official song? So what if you're classically trained. This fight goes back to the old Disco days. Idiot dance music is all this is. I hated Disco back then, still do, its just a bad as rap/hiphop. I at least have a little respect for Disco–at least they could sing and play instruments. The only people saying anything bad about ROCK were the idiot christians and their clergy–saying it was the devil music. It was music taken from JAZZ, BLUES from the 20's-40's and it was great. On the other hand, rap is just a lazy way to celebrety status with out doing anything. Rap is what happends when you give an idiot a mic at a wedding reception. You're all kidding right? A rap song? Which initself is an oxymoron. Rap, music, and song shouldnt even be in the same sentance together. When will this crappy art form end? Its joke. Only crappy to you.There are millions and millions of people worldwide that love it. Who are you to say what should be play and not. Let me answer for you...Your a nobody! Niya, only tin eared nobodys listen to rap–which you obviously are in that group. I will admit there are a lot of you. But that doesnt mean its a valid or acredited art form or music. It only sells because stupid people buy it. I agree with you that many rap "songs" should not be called that. Song implies melody, and some raps are pure rhythm. However, "rhythmic poem with accompaniment" is too long to say routinely, so people will go on calling these "songs." This is not an insult to rap, just a suggestion that it fits better into the cultural tradition of poetry than music, even though its roots are more deeply embedded in musical tradition. Smoking PCP is known as "getting wet." A wanna be singer at a royal wedding? Rapping a song called wet? I laughed till I cried. This is all a joke....right? Hey Joe: we got to remember that they are YOUNG! And when they did a story on what do the Princes listen to on their Ipods 90% of was music from the U.S. and a lot of Black rappers. They are young and that's what they listen to. I'm not a rap fan either SMDH! Not only are they irrelevant, but this proves the royals have no taste, either. OMG – SNOOP I LOVE YOU! Only Snoop could get invited to the Royal bachelor party and come up with a song called "WET!" Dammmmmnnnnnn HELLA YEAH SNOOP!!!! I think I love Snoop Dogg. Love the release time. Only Snoop! Why are his nails so long...and pretty??? because he's very rich and famous and pays for them to look like that. Man, you be prejuice ginst my peoples. I thought he was banned from the UK. He is banned from the UK and Australia. If you have a felony on your record you're not allowed in. I am sure Prince Harry will work a deal out with his G-Ma to get the DOGG in! Do you really think if the Queen and the Prince wants him to perform at the Prince's Bachelors' party that he wouldn't be allowed to. I guess Money talks in England too. He is banned but this morning they said they are making an exception because Prince Williams/Prince Harry has personally requested that he be there for the bachlor's party. LOL! This is just crazy.